The Bernie Fine saga took a huge turn when it surfaced that accuser Bobby Davis had recorded a phone conversation between himself and Fine’s wife, Laurie. The most shocking part was that Laurie Fine openly admitted to knowing about the sexual abuse. Davis had lived with the Fines from time to time and one night Laurie said she saw Fine molesting Davis through the basement window. Syracuse.com has a transcript of the 2002 phone call between Laurie Fine and Bobby Davis. Basically this puts everyone on the hot seat, including Laurie Fine. She openly acknowledges knowing about the husband’s sexual abuse of Davis. What’s even more bizarre is that Davis claimed he had a sexual relationship with Laurie Fine starting at age 18. But anyways, this tape shows that these guys really might be telling the truth. I was a little skeptical at first. 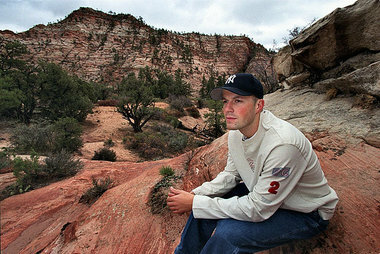 I found it odd that the one person Davis needed to corroborate his story was his stepbrother, Mike Lang. I also wasn’t sold on the third accuser, Zach Tomaselli, who is also facing sexual assault charges, had his estranged father call him a liar. This tape is a game changer. This could get real ugly fast for Cuse. In a few weeks this could be a full-blown Penn State ordeal. You got to thing Boeheim, after going over the top to defend Fine, is on the hot seat. This is bad either way. Is Jim Boeheim the next to be fired? In the wake of the Bernie Fine scandal it appears that Jim Boeheim, much like JoePa, could be the next to be fired at Syracuse University. Boeheim defended Fine early in the accusations and it could turn out to be his downfall. Nov. 18, Bud Poliquin of the Post-Standard posted a story with Boeheim ripping accuser Bobby Davis. 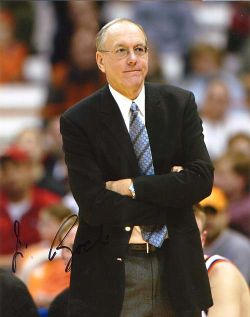 Boeheim did admit that Davis, who lived in Fine’s basement for a while as a teen and served for a time as an Orange ball boy, did periodically travel with the SU basketball team. But, Boeheim offered, Davis traveled for a practical reason. Asked what Davis’ possible motivation would be to tell his disturbing story at this time, Boeheim hesitated not at all. Yesterday when Fine was fired, Boeheim through SU came out with an apology to the accusers. I don’t know if this can save Boehiem’s job. Syracuse University is now being pressured to fire the long-time coach. UConn loses to Central Florida – Huskies blow a 17-point lead and struggles against a 2-3 zone. Need lots of work if they want to top Syracuse. Ryan Boatright played his first game Saturday in a 78-76 overtime win over No. 20 Florida State. The freshman had 14 points and three assists. He adds another ball handler and will help this team in the long run. Syracuse wins NIT – The Orange, in the wake of the Bernie Fine scandal, won the NIT Season Tip-Off in a convincing win against a solid Stanford club. This Cuse team is deeper than usual. Also Fab Melo looks great since dropping over 30 lbs. in the offseason. Right now tops in the Big East. Louisville sneaks out win over Ohio – Rick Pitino won his 250th game with Louisville in a close one, but I like Louisville right now. They beat Butler without Peyton Siva, who is their key player and would I picked to have a breakout season. Villanova downed by Saint Louis – This loss isn’t terrible because I believe that Saint Louis is an overlooked team, they’ll compete against Xavier and Temple this year. The Wildcats are young, but Maalik Wayns had a career-high 29 points. Cincinnati upset by Marshall in OT – I really think the Bearcats could take that next step and be a legitimate Big East contender this year, but after this loss I don’t know. The Thundering Herd could be the second-best team in C-USA, but this is a win Cincy should have had at home. Pitt takes care of Penn/Robert Morris– Panthers had a little hiccup in that loss to Long Beach State, but I think they’ll make up for it if they can get good wins over Tennessee and Oklahoma State. Also Khem Birch recording 10 boards in his first start against Penn is a positive. The freshman added 11 in a 10-point win against Robert Morris. DePaul moves to 4-1 – The Blue Demons picked up a pair of wins against Texas Tech and Arizona State this weekend. I like this team. Oliver Purnell shows he can rebuild. He’s got two good young pieces in Brandon Young and Cleveland Melvin and from this point on a pretty easy non-conference schedule. South Florida takes care of FAU – A couple of nice wins against Georgia Southern and Florida Atlantic without Augustus Gilchrist. They need the big man back soon with road games against VCU and No. 14 Kansas coming up. Notre Dame loses Abromaitis – Senior forward Tim Abromaitis is out for the season with a torn ACL. Abromaitis was averaging 14 points and seven rebounds on the year. Mike Brey is a great coach and will see how good he is in the coming months. St. John’s loses to Northeastern – It’s a young team and a short rotation. Also not favored by a tough schedule. The Red Storm have losses against No. 16 Arizona and No. 18 Texas A&M. Coming up is a game against soon to be No. 1 Kentucky. Friars lose first two – It’s going to be a process by I feel Ed Cooley has this team on the right track. This year is just going to be a tough one for Providence. However Vincent Council has a had a good year averaging 18 points and 5 dimes. want to hear about. Late Thursday evening, two former Cuse ball boys – Bobby Davis and Mike Lang, now grown adults accused long-time Syracuse assistant Bernie Fine of molesting him. The story has been out since 2003, but not reported due to no corroboration, until Davis’ 45 year old stepbrother, Lang came out and said he had also been molested after spending a lot of time with Fine. “Probably 15-20 times,” said Lang, answering how many times Fine had groped him. “I didn’t feel right about it and I told that ‘Bernie please don’t do that to me. “This matter was fully investigated by the university in 2005 and it was determined that the allegations were unfounded. I have known Bernie Fine for more than 40 years. I have never seen or witnessed anything to suggest that he would been involved in any of the activities alleged. Had I seen or suspected anything, I would have taken action. 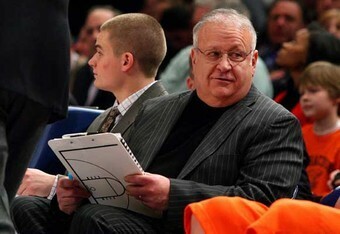 Bernie has my full support,” said Boeheim. “This kid came forward and there was no one to corroborate his story. Not one. Not one. 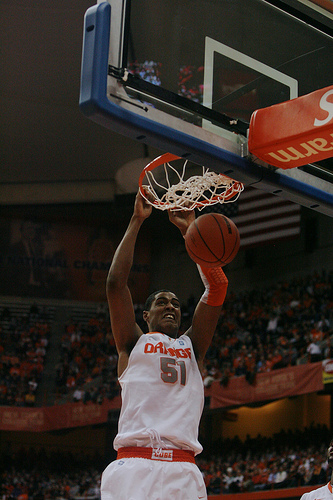 … This just is not true,” Boeheim told the Associated Press. This isn’t good at all, especially with all the fire surrounding Penn State. You hope it doesn’t affect the team or the school, but that’s a secondary issue. The main issue is whether this really happened and whether or not people knew about this. Fine is a very well respected coach in that area and after JoePa’s legacy went in the garbage, you hope the same won’t happen here. Not making any decision on how I feel until more information comes out.